April 25, 2018 — Heartland Center Trainee Kayla Faust is being highlighted for her efforts to promote farm safety as part of the University of Iowa’s Dare to Discover campaign. The campaign is an initiative of the University of Iowa Office of Research and Economic Development designed to showcase researchers, scholars, and creators who are making a difference through their work. Banners featuring these individuals will be hung throughout Iowa City. 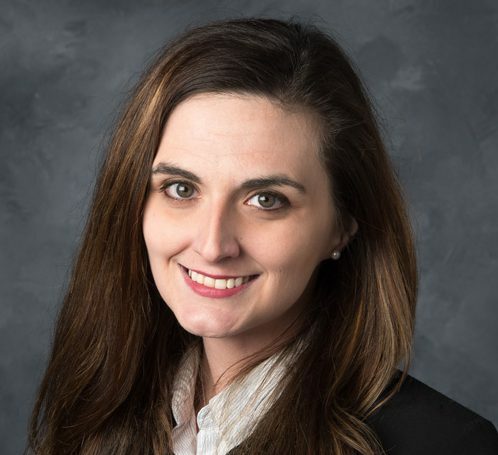 Faust, a PhD student in the Heartland Center’s Occupational Injury Prevention Program, is being recognized for her research that examines driving performance among farmers using a new, PC-based tractor driving simulator. Faust further states that she is seeking a career where she can “comprehensively address traffic and farming safety problems from exposure assessments to the development and evaluation of interventions.” The Heartland Center is proud to help prepare her for that work. I’ve always wanted to help people, and I’ve always been a problem solver. I thought about going to medical school for a while. But after receiving my bachelor’s degree from the University of Iowa, I had an opportunity to pursue doctoral studies in public health, and I decided to do that because the College of Public Health has been so active in agricultural safety. I’ve been involved in research to improve grain bin safety and develop improved rescue techniques for people trapped in grain bins, and also protecting farmers’ hearing. We’re one of the leading research centers for agricultural safety, which makes sense because Iowa is a farm state and we have so many opportunities to observe farmers in their natural environment.